My favorite quote of all time is “Success is for rent and the rent is due DAILY”. In other words, if you want something you gotta work for it daily. Whether you want to loose weight, save money, or be the best at your craft, you have to believe you are on the never ending journey to the palace of success, wealth and health. Once you wrap your mind around the idea that success doesn’t happen overnight and there is no such thing as a”big break”, it becomes easier to create daily routines and practices that will help you along the journey. It is no secret that I love to face paint. So much so I turned my hobby into a passion into a career. Which is why its been so hard for me to cut back and not take on so many jobs during the weekends. Part of the reason I love painting and doing parties is because I get to test and try new products, I get to talk to potential customers, do field research ( learning new design trends) , the money is awesome, and I get new material to blog about. When I write these blogs, they come from a real place. I wouldn’t guide another entrepreneur down a road that I couldn’t help them through. 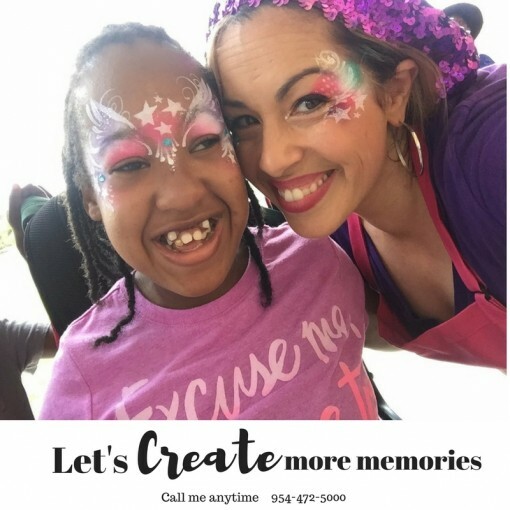 This summer was unusually slow in my area for face painting jobs, whether its the extreme heat, the threat of Zika, or more families were taking Holidays the face painting industry was dead. During a business round table with my entrepreneur group we went over challenges facing our businesses. I explained that summer was slower than normal and one of my peers asked how different from last year? I said I ‘felt” like it was much slower. She said did I pull a report, did I have numbers to compare? Were sales down? And my answer was no… so her next question was so how do you run that part of your business? I said I live and die by my online calendar. And that was my AH HA moment and the inspiration to write this blog. I rarely ever book myself because I have Silly Farm, FABAtv, Paint Pal, FABAIC, and my family life to manage. So I leave the booking up to the professionals at My FAB and All Star. About 6 years ago my agents set me up on an online calendar and since then it has been the single most important tool I use in my daily business activities. Its also a bad bookkeepers best friend. Here’s why. If you are like me in that you don’t book yourself, you probably don’t have every job you have done written down and invoiced with specific details. You cant run a report and compare sales by day summaries. Chances are you struggle to keep records and have little to no time for bookkeeping. And then you panic come tax season Don’t worry I feel your pain because I too live this life. But what my online calendar has done is allow me to organize myself, keep a snapshot record of previous years bookings, and open myself up to possibilities. You cant drive a car you don’t have, just like you wont book up a calendar if you don’t have one to fill. Most of our phones have a calendar attached to them and if you use any Mac products your calendar is the easiest thing to manage on your devices plus they are all linked. I use a program called Huntcal and I love it. It allows me controls on who can view, add to my calendar, and keeps really great track of my information. I am primarily booked by agents, who’s only job and concern is to book events. They dont want to have to wait around on an answer or call me. I give them parameters and permission to book me if I am showing open on my calendar. It makes us both happy, because they book me and make their clients happy fast and I am happy because I have an easy way to communicate with my agents. My mother is a micromanager. She loves lists, and schedules and then there’s me. Sometimes I think I am going to give her a heart attack because I live in the moment and SOMETIMES forget to add everything to my calendar. Her constant nagging has helped me to use my calendar to the best of its ability and for that reason I usually have a pretty full calendar. Because my calendar is public I set the controls to show the things I want visible and have a standard “reserved” or “Not available” text that I apply on the front end. I also ask my agents to place a “pending” or On hold when they are reserving a date and set a reminder to remove or follow up a week later to make sure I don’t hold on to a time slot that. 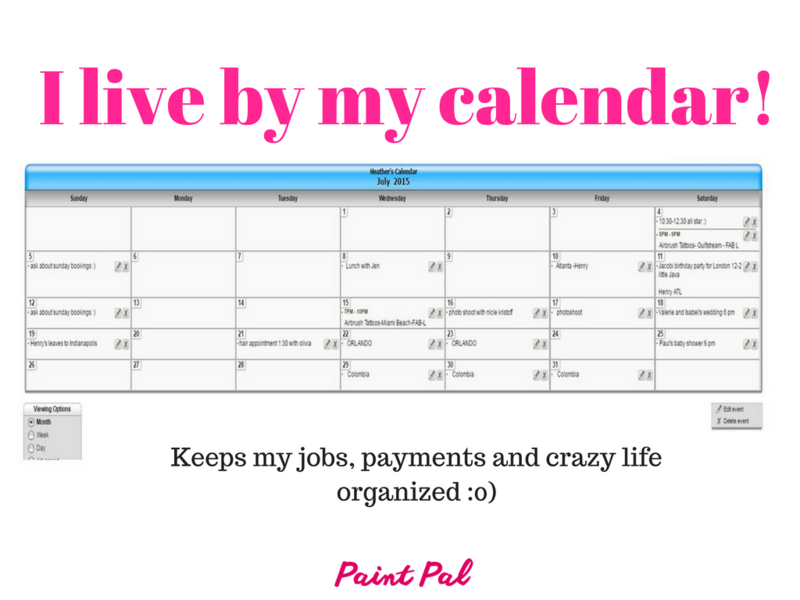 I update my calendar weekly and also mark “paid” when I receive payment for the jobs. In the past ( before my calendar) I would forget sometimes to collect or if someone paid me. I just had so many things going on that it would slip my mind. Now I have a better understanding and grasp on payments, bookings and it helps me plan my teaching tours too. I can look at my calendar and see an pretty open month and that gives me availability to book a workshop, family vacation, or hustle to drum up bookings. Seeing your month in advance gives you insight on how to plan, prioritize, and maximize each months potential. Even though I majored in Finance I have always LOVED marketing. Marketing is making a connection to people, making friends, sharing interests and building relationships. I use my calendar to help me market my services. I print and review my calendar 3 months at a time to reach out to previous clients. I send reminders and pictures! Remember the blog I wrote about the importance of taking selfies and pictures at events, they come in super handy. Here’s the perfect example. A great marketing tip for you. Check your calendar make a list of events you would like to do again. Send a friendly email to them with a picture from previous years past. Remind them as to why to would be awesome to hire you again. We are all busy people and loose track of details its not only thoughtful but also a great way to market to your past clients. Another marketing calendar tip is if you see your calendar a little low on bookings send your calendar link to your agents or clients with “specials” written on days you would like to be filled. Like offering mid week promotions save $10 on this date, or lets create memories dates available this month…. if you plant the seed your are preparing for a harvest. Success is rarely given, its earned by long hours, invested energies, taking chances and staying consistent. Utilizing a calendar is one of the most cost effective ways to manage your events, personal life, and marketing efforts. And the best part is that many online calendars are free. 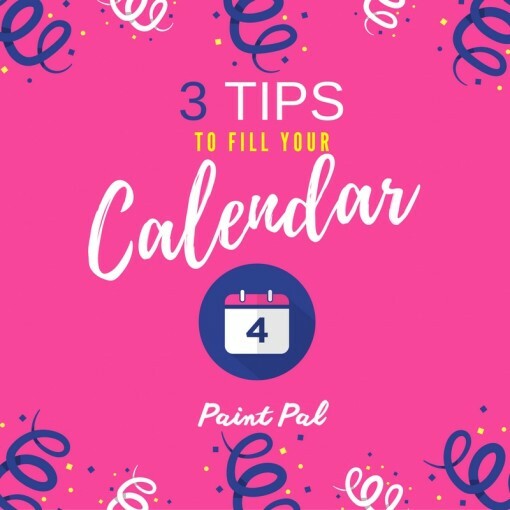 If you are looking for ways to increase bookings and get a better grasp on your marketing efforts using a calendar is a simply and effective way to get started. There will never be a perfect time to claim success, you just have to get started. Every step is a step in the right direction. Hope everyone had a great weekend. As always feedback is welcomed and appreciated. Make sure to follow us on social media to find out about all the awesome things going on.